Epping guides made a splash today in more ways than one! 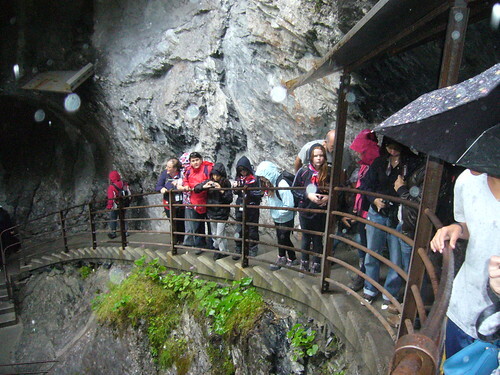 First off to Trummelbach waterfalls near the town of Lauterbrunnen. We were kept fairly damp as the spray from 20,000 litres of water a second gushed by us but also as we went outside the sky tried a little sprinkle of its own! Amazing falls have carved some beautiful shapes into the rock. The water crashes down around you with such deafening thunder that I couldn’t hear one of the guides. If you had heard them singing on the train- you would know those falls must be mighty loud! So we dripped our way out of Trummelbach towards the beautiful mountain views of Grindelwald. Luckily these guides like water and carry round with them their little blue guide centenary ducky just to prove it. Ducky is not the only one who paddled today as it became a bit of a competition for 3 of the guides as to who could splash the others the most. You are never far from a water fountain in Switzerland and some of the ladies have the soggy shirts to prove it! Ducky then spent the afternoon squirting water in my ear! I may need to purchase a water gun to defend myself against ducky and his water friends!